Donald Trump's war on the press has gone nuclear. "If the disgusting and corrupt media covered me honestly and didn't put false meaning into the words I say, I would be beating Hillary by 20%," Trump said Sunday in one of seven anti-media tweets. The GOP nominee tweeted about no other topics on Sunday. His focus is exclusively on the news media that he says is "protecting" Hillary Clinton. He also tweeted, "It is not 'freedom of the press' when newspapers and others are allowed to say and write whatever they want even if it is completely false!" The comment was widely derided by journalists, since the First Amendment provides broad protections against government interference with the press. With Trump losing to Clinton in polls of key swing states, many Republican and Democratic analysts say they doubt that media-bashing is an effective strategy for persuading voters. But Trump's most vocal supporters are literally cheering for him to fight the media. His crowds at rallies regularly boo and jeer the journalists who cover the events. On Saturday night, when Trump said The New York Times is "going to hell" and threatened to revoke the newspaper's press credentials, the crowd applauded approvingly. Politicians, particularly from the Republican party, frequently complain about media scrutiny and accuse journalists of being biased. But the ferocity of Trump's attacks is unprecedented in modern American politics. He is explicitly running against the news media, even while running a campaign that relies mostly on news coverage instead of paid ads to communicate with Americans. "He's turned to bite the hand that fed him," former Time Inc. editor John Huey said on Sunday's "Reliable Sources." Huey called Trump a "demagogue" and said journalists are his new scapegoat: "First it was the Mexicans, then it was the Muslims, now it's you. It's the media." 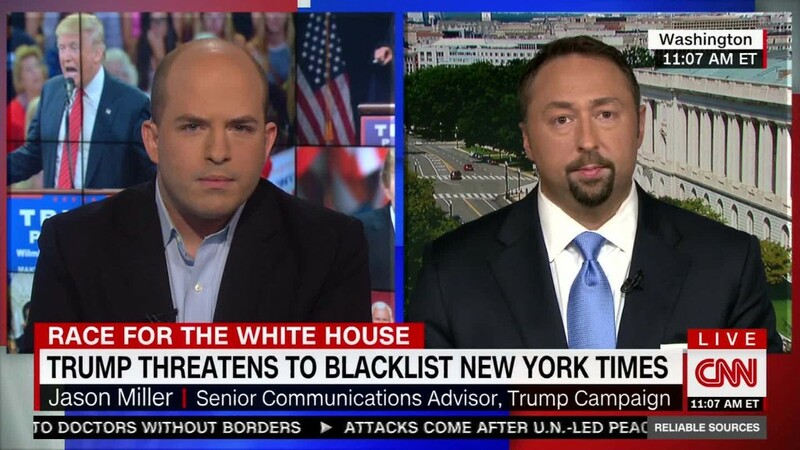 Trump's senior communications adviser Jason Miller said the media critiques are necessary. "If there's completely biased, ridiculous reporting that's going on, then, look, we have to stand up and defend ourselves," he said on "Reliable Sources." Later in the day, Trump national spokesperson Katrina Pierson said on "CNN Newsroom" that "the media has been writing the Trump campaign's obituary for 424 days." The campaign has been circulating "media bias award" emails. And Trump himself has been on a tear in recent weeks, criticizing CNN, The New York Times and other outlets nearly every day. On Friday he called CNN "catastrophic." On Saturday he called CNN "disgusting." He continues to be a loyal cable news viewer and news website reader, however. 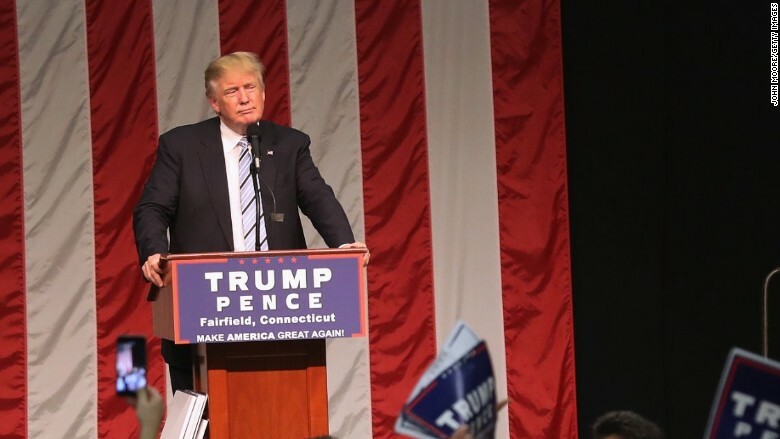 Donald Trump at a rally in Connecticut on Saturday. The Times reported over the weekend that Trump calls campaign manager Paul Manafort "several times a day to talk about specific stories." The Times story painted a dire picture of the Trump campaign; said that some of Trump's advisers "now increasingly concede that Mr. Trump may be beyond coaching;" and asserted that "in private, Mr. Trump's mood is often sullen and erratic, his associates say." The campaign strongly objected to the story, and Trump said "the newspaper is going to hell." He also tweeted, without evidence, that its stories "always quote non-existent unnamed sources." Miller, on "Reliable Sources," said the article is "talking about things that didn't exist." "I would take the entire article and throw it in the trash," he said. However, he declined to say whether he would ask the paper for a correction. A representative of The Times said the editors fully stand by the story. In a move that has troubled many press freedom advocates, the Trump campaign has denied press credentials to several prominent news outlets, including The Washington Post, Politico, and The Daily Beast. This month Trump has started talking about adding The Times to the list. "When they write dishonest stories, we should be a little bit tough," he said Saturday. When asked if Trump was serious about this, Miller said, "We'll see." Separately, Trump's running mate, Mike Pence, said on "Fox News Sunday" said a relaxing of the so-called blacklist is "an ongoing discussion in the campaign."